Richie Cotton was a butcher and is currently an on-call actor with 32 years of experience for drama and commercial TV work. The creative gene was already there but just hiding. Creative writing comes naturally at this stage of his life. He loves rhyme and imagination because he’s a dreamer with creative, quirky, wild and childish visuals. As he progresses in this visual world, he thinks, watches and writes. Catch a child’s imagination with rhymes and they’ll ride that reading train for the rest of their lives. The idea of writing children’s books happened on a kitchen table nine years ago, with a little boy named Billy who needed entertaining with silly rhyming games and words. Billy was a three-year-old who inspired two rhyming picture books of poems for children: Giggly Times, Giggly Rhymes one and two. The books were illustrated by his mum, Rhonda, and self-published using our own funds. Over the nine years, the books are now in seven thousand homes and schools in Australia and worldwide. 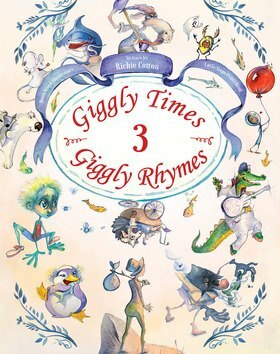 The third book of Giggly Times, Giggly Rhymes is currently in the final stages of production with Little Steps Publishing and Bookwood Illustrators, and will be released later this year. In the last few years, Richie has been a guest speaker in 150 venues including Probus, View clubs’ seniors, Travel clubs and for the vision impaired.